Tough day at work? Treat yo’self to a well-deserved island getaway… well, kinda. There’s no need to fork out on tickets to Hawaii—a tropical oasis can be found in the heart of Britomart. Here you’ll stumble upon the intimate tiki bar, Talulah. And the best bit? Their happy hour is totally tiki-tastic! Kicking off between 4pm and 7pm, you’ll find a daily cocktail for just $10 (yes, $10!). 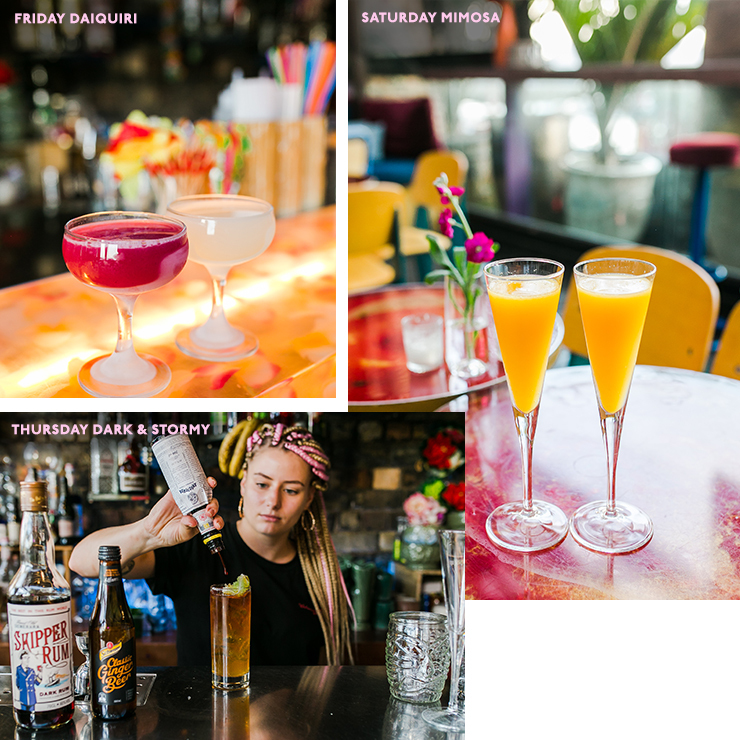 Drink your way through the days of the week as you magically transport yourself to a South Pacific Paradise. The décor is enchanting, the drinks are refreshing and the vibes are chill af. Is this Maui or is this Auckland? It’s anyone’s guess! Tiki Time kicks off each and every Tuesday with a rum-fuelled Mai Tai. The classic cocktail stars a refreshing mix of lime juice, curaçao and orgeat (a sweet syrup made from almonds). It’s tarty, it’s citrusy and—in our humble opinion—it’s the perf way to ease into your Tuesday evening! 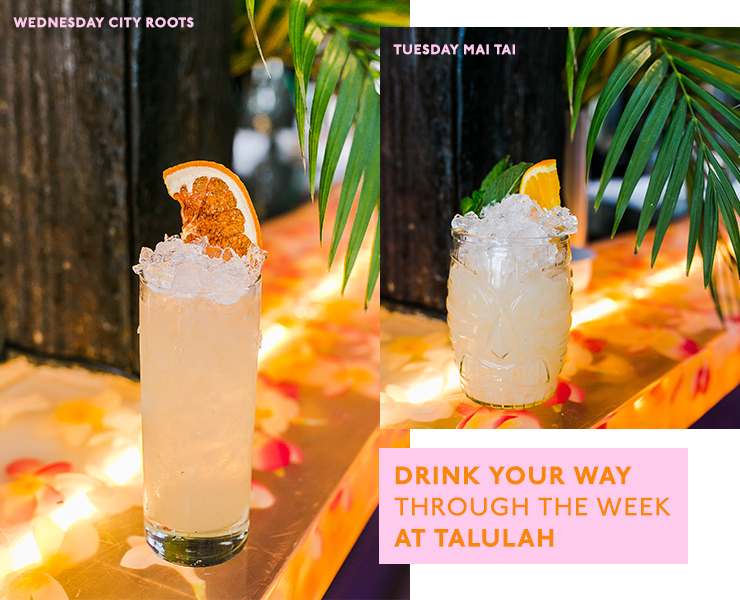 Hump day means one thing at Talulah: it’s City Roots time! This tropical banger features falernum (a Caribbean-esque syrup of almond, ginger and lime), banana, lemon and—of course—rum. Celebrate making it halfway through the week with rounds of this epic cocktail. It’s the calm before the weekend but things are getting stormy at Talulah. Yep, Thursday nights are all about everyone’s fave rum-based cocktail: Dark & Stormy. Sip on dark rum perfectly paired with ginger beer and a hint of lime. The spicy, comforting cocktail will warm you from the inside out. Yeow! You made it to Friday. Cheers to your success with a Daiquiri (or two) at after-work drinks. This bad boy features a simple, tangy combo of light rum, lime juice and simple syrup. Trust us when we say: Fridays have never tasted so refreshing. The working week is over but things are just getting started at Talulah. On Saturdays, $10 will get you not one but two Mimosas. What a total steal, right?! Bring along bae (or your BFF) and sip on the orange juice cocktails spiked with bubbles. Saturday night, come at you! Cocktails and good times don’t get better (or cheaper) than this. Tiki Time kicks off from 4pm to 7pm every Tuesday to Saturday at Talulah. We’ll meet you at the bar! Editor’s note: This article is proudly sponsored by Talulah and endorsed by The Urban List. Thank you for supporting the sponsors who make The Urban List possible. Click here for more information on our editorial policy.